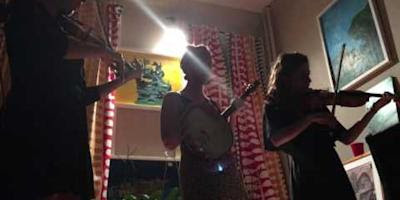 The Ladles create three part female harmony perfected with music influences that span swing, old-timey, neo-soul, & choral music with a sound that is all their own. Using solely acoustic instrumentation and three voices, they create a dreamy, otherworldly atmosphere that draws audiences in and demands attention. They quiet noisy bars and liven up staid concert halls. The Ladles are Katie Martucci, Caroline Kuhn, and Lucia Purpura-Pontoniere. All three are songwriters and performers in their own right. Together they create a beautiful harmonious sound. Sam Talmadge is a songwriter, finger picking guitarist, banjo player, and pianist who hails from Atlanta, Georgia, spent time as a resident of New Hampshire but is now based in Boston. He studied at Walnut Hill, an independent arts high school in Natick and more recently studied music composition at the New England Conservatory. He has worked solo, as a duo, and currently is a member of Ruthless Moon along with Caroline Kuhn of the Ladles , Elise Leavy, and Dan Klingsberg.